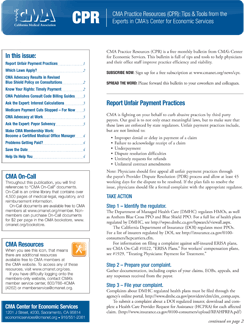 CMA Practice Resources (CPR) is a free monthly e-mail bulletin from CMA’s Center for Economic Services. This bulletin is full of tips and tools to help physicians and their office staff improve practice efficiency and viability. Please forward this bulletin to your coworkers and colleagues. Click here to see past issues of CPR. Click here to download a printable version of this newsletter.